BFL Apartments’ tenant Niasia signed on for the Assurant Financial Empowerment Scholarship program last year with a clear goal in mind: attend beauty school. 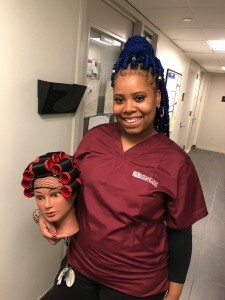 Niasia, who completed the BFL Apartments’ 8-week workshop and was awarded a financial scholarship, began classes at American Beauty School in the Bronx this month (photo above). Niasia is one of 8 workshop graduates who secured scholarships to pursue a career or educational goal.